Once again we celebrate a successful conference. This time at Petone. It is the highlight of our year and usually it is my personal highlight too, but this year I am up to something bigger. More about this later. First we must thank all the sponsors and supporters of our Trust, especially the hosts of this year’s conference; Hutt City Council. It was especially pleasing to see so many new faces at the Dunes 101 workshop and the conference, who are keen on restoring and managing our coast using native plants. We look forward to seeing you all next year. In this newsletter I must pay a special tribute to Mark Dean who is retiring as a trustee. 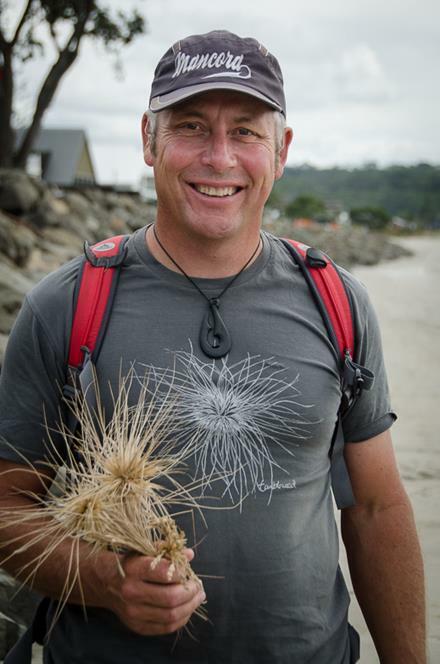 Mark was among the first group of passionate people who initiated growing and planting our native sand binding plants on our dunes. He was chair of our Trust for many years and the 2011 recipient of the prestigious Loder Cup for outstanding achievements in flora conservation work. 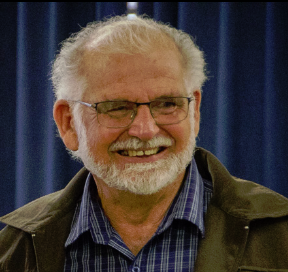 It is sad that Mark is retiring but we celebrate his achievements and he is not really retiring as he is keeping busy as a Western Bay of Plenty District Councillor and will always be a valued advisor of the Coastal Restoration Trust. So, what is a bigger highlight than our annual conference this year? In May my wife & I embark on a walking holiday around Wales. We will be walking the entire Coast Path and Offas Dike Path which, with a few detours, will take us 4 months. Maybe I will give a short presentation on the coastal features of our holiday at the next conference. Laura Shaft, our Northland trustee, will be acting as Chair in my absence. 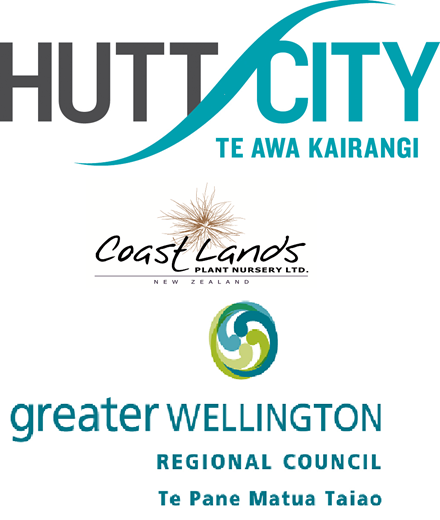 We thank the sponsors, who helped make our conference possible, especially our Host and Core Sponsor Hutt City Council, Premier Sponsor Greater Wellington Regional Council and Gold Sponsor Coastlands Plant Nursery. We also thank Daltons, who sponsored afternoon tea on the Wednesday. We much appreciate their support and involvement and couldn't have done it without them. Another great conference was held in March and this time it was based in Petone. A free dune restoration workshop the day before was well attended and well reviewed. This was the best day weather-wise. The main conference was a combination of presentations and fieldtrips and also got good feedback. Unfortunately the weather wasn't quite so wonderful, but that didn't dampen our spirits. 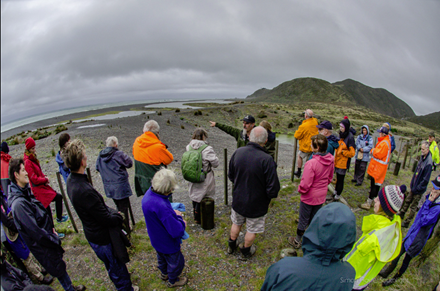 Some delegates continued on to the Wairarapa, where they visited another five sites over the weekend. They were joined by local experts from DOC and Greater Wellington RC, as well as local volunteers, councillors and other interested people. Many of the presentations can be found on our Petone Conference page and photos by Simon Hoyle of Southlight and others can be found on the Petone Gallery page. Photo: Mark McAlpine of GWRC talks about the Fitzroy Bay coast. 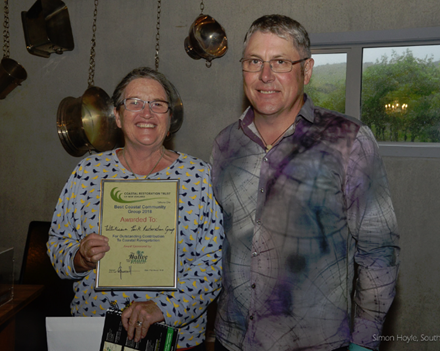 Robyn Smith of the Whitireia Park Restoration Group was presented with the 2018 Best Coastal Community Group Award at our recent conference. 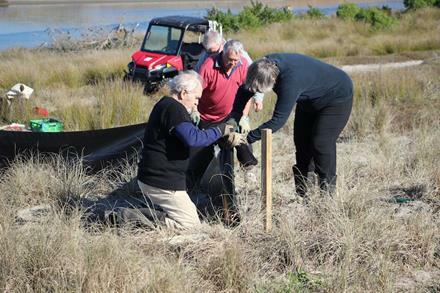 The group has been planting, doing pest and weed control and monitoring lizards since 2006 and gradually expanding their range to include a wetland and an estuary. This award was kindly sponsored by The Native Plant Nursery. 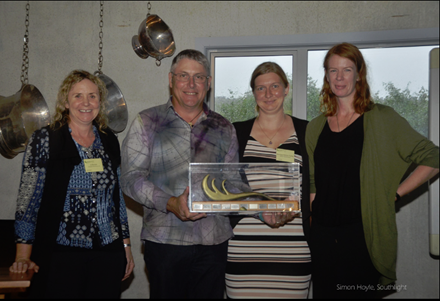 Port Waikato Beach Care was presented with this year's Best Coastal Community Project Award. The group has been doing work in the area, including bird protection, for over 20 years. Unfortunately Karen Opie, the group's main driver wasn't at the conference, so Moniqua Nelson-Tunley of Waikato Regional Council (3rd from left), who has been supporting the group, received it on her behalf. This award was kindly sponsored and presented by Jo Bonner (left) of Coastlands Plant Nursery. Others on photo: Chair Greg and Stacey Hill from Waikato Beachcare. There are anything up to 200 small and very small community conservation groups scattered around New Zealand. Most of them do sterling work on a shoestring and have a fairly constant struggle to raise funds and hang on to volunteers and the people who run the groups. They are also effectively competing with each other for resources. Bay Conservation Alliance looks to bring groups together to work collaboratively, to sort out the crazy funding structures that we have, and to put environmental restoration at the forefront of everyone’s consideration so that our mokopuna and beyond can enjoy the most amazing natural biodiversity found anywhere in the world. To learn more about this Alliance and how it can be applied to your local area go here. Over the last three years the Coastal Restoration Trust has been collaborating with a number of research partners developing methods for monitoring dune vegetation and profiles on our sand dunes. The aim was to provide easy-to-use monitoring guidelines for Coast Care groups, landowners and management agencies involved in restoration programmes on coastal dunes. 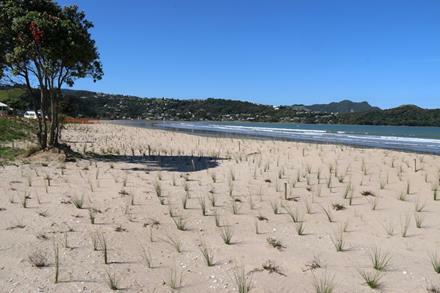 The project was funded by the Ministry for the Environment’s Community Environment Fund in collaboration with Coast Care and Beach Care groups, iwi and coastal landowners and with support from our research partners. These included Northland, Waikato, Bay of Plenty, Greater Wellington and Canterbury regional councils, the Christchurch City Council, Timaru District Council, the Department of Conservation, and Te Kohaka o Tuhaitara Trust in North Canterbury. These monitoring guidelines along with a data management system are about to be launched on our website. The Waikato Regional Council and Coastal Restoration Trust are evaluating the use of digested koi carp in a range of products for positive environmental gains in community-based restoration initiatives. 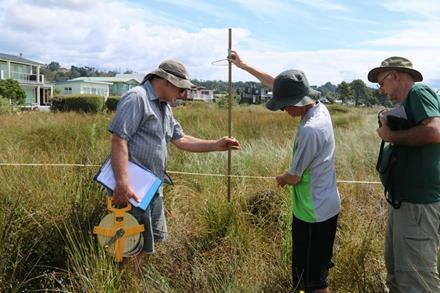 This project has been funded by the Ministry for the Environment’s Community Environment Fund with support from the Waikato Regional Council, local community Beach Care groups, and CRT research partners. It includes ongoing evaluation of digested koi carp as an organic fertiliser option for boosting the performance of the natives on dunes as part of dune restoration programmes. Planning is well underway in setting up trials to evaluate other potential uses for various formulations of digested koi carp that could be used by community groups. The uses being investigated include: as animal repellent, as rodent bait, for nursery propagation, as fungal and insect control or mixed with bio-char made from willows to improve smell and carbon storage. Photo: Trial with koi carp fertiliser at Buffalo Beach, Coromandel. 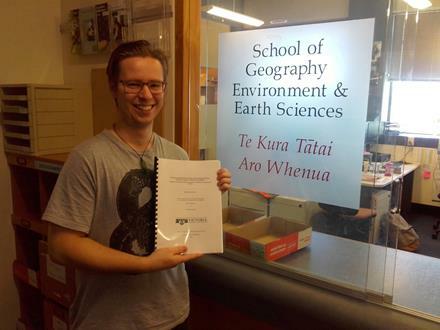 Back in March, just a few days before the Coastal Restoration Trust conference, I submitted my Masters thesis, after much hard work, some set backs and no small amount of lost sleep. The project was the culmination of a lot of support from a lot of different people. The Coastal Restoration Trust was a big part of this, with the financial contribution from the graduate research scholarship. This research project was very successful and the results will be written up for submission to the Journal Geology. This thesis, titled: Histories and Mechanisms of Change in the Development of Shore Platforms at Kaikōura and Rodney, New Zealand: Application of Cosmogenic Nuclides and Numerical Modelling on Exposed Coastal Surfaces, is summarised in brief on the CRT website. Together with trustees from the Coastal Restoration Trust, we designed a study to test the insulating qualities of custom-made nest boxes for burrowing seabirds breeding in dunes. Results, recently published in the March issue of the journal Notornis, showed that these custom-made nest boxes mirrored conditions expected in natural burrows: there were no temperature or humidity fluctuations. In other words, the applied insulating measures of these nest boxes worked. Therefore, we recommend the use of insulated nest boxes, or the application of additional insulating features to existing nest boxes, for seabird species breeding in non-forested areas, such as dunes. Jo Bonner, who many of you will know from Coastlands, our main ongoing sponsor, was welcomed onto our board in the middle of last year. Apart from growing pingao and spinifex for projects around the country she is also involved in Forest and Bird, DOC and other organisations. For more about Jo, go here. Alison Waru was welcomed onto the board at the end of last year. 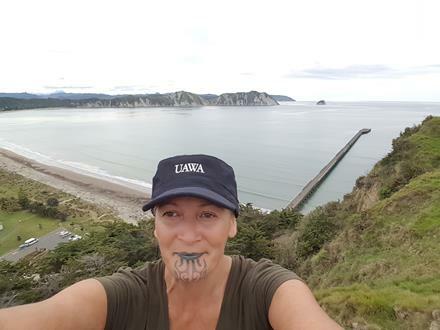 She is from Uawa/Tolaga Bay and is involved in coastal restoration in her rohe as well as environmental education in local kura. She first became involved in the trust when we had our 2016 conference in Gisborne and she has stuck with us since. For more about Alison, go here. Mark Dean was a trustee from the beginning of the trust and a very inspirational Chair for six years. He has been trying to teach us to 'think big'. Two years ago he got elected to the Western Bay of Plenty District Council and no doubt he will continue to spread the message of the trust. There are a few small companies that have been quietly making money for us. We want to acknowledge Tumbleweed Tees, who have been donating a share of their sales of spinifex t-shirts for many years and some of you have them, possibly bought at one of our conferences. 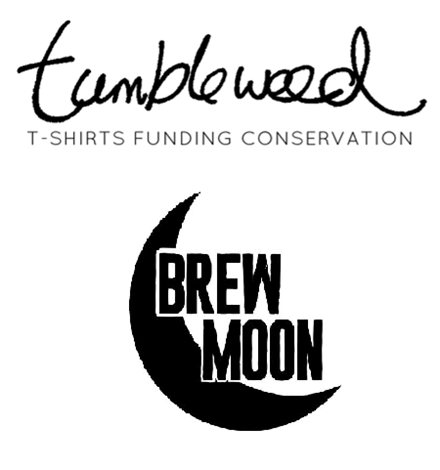 A new donor is Brew Moon, a small brewery in Amberley, who charge a plastic tax on filling plastic riggers to encourage people to bring their own to refill. They donate a share of this to us. They even increased the price, so we get more! All these little bits help us to keep going, so if you know of anyone who might be able to do something similar for us, get in touch. Or... if you feel we deserve some $$ and have some to spare, you can go to our give-a-little page, or ask us for our bank account number. We want to thank Simon Hoyle of Southlight for generously donating his conference photos to us and for allowing everyone to download and use them freely. All conference and award photos in this news are by Simon. Both the east coast and the west coast of the South Island have penguin events coming up. 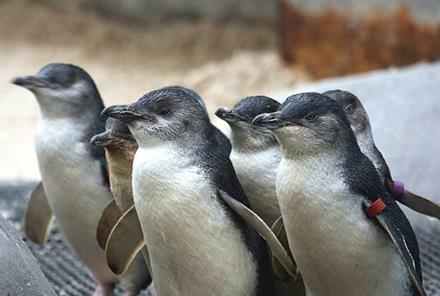 Oamaru is hosting a penguin symposium on 3-4 May. For more information go here. The West Coast Penguin Trust is hosting the Community Conservation Symposium on 14-15 June in Shantytown, near Greymouth. Check out the details. A reminder to keep an eye out for this movie. It has some very important messages for us. 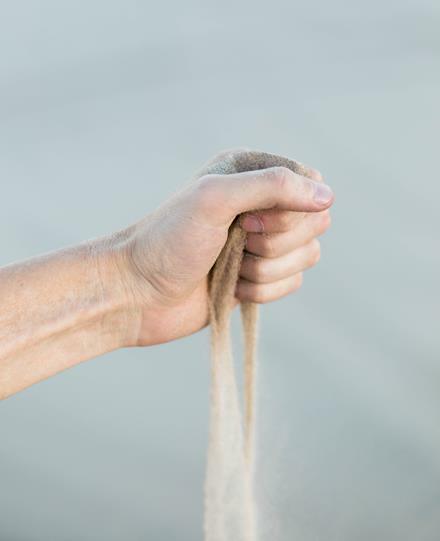 Most people will not be aware that sand is a finite resource like water and oil, and that it is rapidly becoming scarce and causing beaches to disappear. An eye opener! Public copies have disappeared off the web due to copyright issues, though some people try to get it back on in roundabout ways. Here is a TED talk about it from the director. Here you can pay to see or buy it. It is that time of year again, when we all get busy putting lots of plants into the ground, whether they be dunes or elsewhere. Wishing you all nice fine days for the work followed by good rain to get the plants established. Let us know how your work is going. Send us a few lines and a few photos for our news page or newsletter if you can find a rainy day to do so. Keep warm, share the work and reward yourselves with hot drinks and cake!